It is with a very sad and heavy heart that I make this post today, as yesterday, my wife's and my pet rabbit, Anakin, passed away. 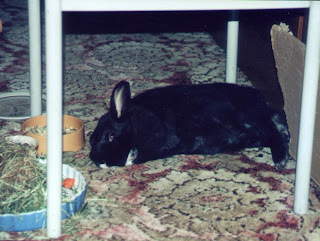 He was an adorable little bunny, who was our substitute child and very much one of the family. I know this may sound strange to those who don't have pets, but I hope there will be those who understand how his passing has affected us very deeply and we are both mourning for his loss. He appeared a little tired and listless on the Sunday evening and on the Monday morning, he died in my arms as I held him. While he was at least seven years old, his death still came as a shock to us because he seemed so full of life only a couple of days ago. Yet, it was time for God to call him home and even as much as it breaks our heart to have him go, we accept God's Will and pray that Anakin is now one of our treasures in heaven. 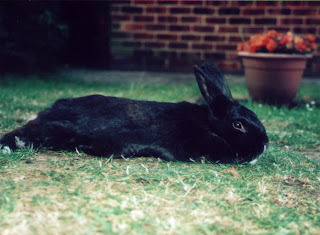 Anakin was a house bunny, but often went outside whenever he wanted to play and have some fresh air. My wife, Jennifer, would spend up to two to three hours sometimes, playing with him and keeping an eye on him as he sat outside, to make sure no harm ever came to him. When he had had enough, he would come bounding back indoors for a treat before settling down for an evening of love and attention, which could easily last another couple of hours. He never went without attention, and was always given as much time, care and love as was needed and we could give. We actually only had Anakin for just over four years and three months, as we took him from a friend of my wife, who suffered from cancer and could no longer take care of him. She, in turn, had found him at a Rescue Home, where we believe he had been part of a litter that had been passed on to them. However, both Jennifer and I have always believed he was destined to become part of our family, and we are thankful that he spent the majority of his life with us, running free in a Christian home, where he received as much love as anyone could give their "little boy". God bless you Anakin, we will miss you deeply. Love Mummy and Daddy. Matthew 6 v 19: "Do not store up for yourselves treasures on earth, where moth and rust destroy, and where thieves break in and steal. 20 But store up for yourselves treasures in heaven, where moth and rust do not destroy, and where thieves do not break in and steal. 21 For where your treasure is, there your heart will be also." We are sorry to hear of your sad loss and hope you will take some comfort in remembering the brighter moments you shared with Anakin.